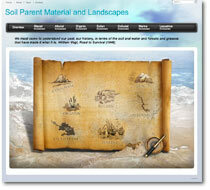 This website illustrates processes of soil parent material and landscape development. Video footage was obtained in the Rocky Mountains and southern interior of British Columbia to enable students to visualize similar processes that occurred in the past. The website also allows for an exploration of impacts of climate change on glacier retreats. This multimedia website has been developed for postsecondary students enrolled in natural sciences courses that incorporate soil formation and classification. The specific learning objectives are to allow students to (1) identify various types of soil parent material, (2) describe soil parent materials and associated landforms, and (3) develop an understanding of the effects of parent material on soil properties. The Virtual Soil Science Learning Resources group was sparked by Dr. Maureen Kent, founding Director of the Learning Centre with the Faculty of Land and Food Systems. Maureen’s vision, perseverance and innovation during her career at UBC continues to impact numerous on-going education programs and initiatives including our own. Thank you Maureen! © 2019 Virtual Soil Science Learning Resources. Theme by XtremelySocial.